The ACM SIGGRAPH Digital Arts Community has unveiled their latest online exhibition, entitled "The Aesthetics of Gameplay." Curated by Greg Garvey, Director of Game Design & Development at Quinnipiac University, the show spotlights the art and gameplay design of 45 refreshingly original independent games. According to Garvey, the games selected for the exhibition demonstrate exceptional creativity on the part of the developers. "All games in 'The Aesthetics of Gameplay' have emerged from the indie game scene … from independent developers who are uniquely creative in putting together striking and distinctive aesthetics with engaging gameplay," he said. The exhibition is intended to spotlight the creative output of digital artists working in areas not previously represented in ACM SIGGRAPH DAC art shows. Titles were nominated by a select group of game industry professionals, and run the gamut from puzzles to fantasy world exploration and generative music production. One game even involves the use of a stuffed teddy bear as a controller. The player controls the gameplay by hugging the bear at various points throughout the game — and with varying intensity — to overcome obstacles. "The exhibit encourages a cacophony of divergent tastes, styles, subject matter and genres. It's not about purely visual assets like playable characters, cool weapons, stunning background architecture or breathtaking landscapes. Rather the focus is on games that incorporate the merger of interaction with the aesthetics (story, visuals, animation, music, sound, engagement and fun). It's in this artful combination that we find the fundamental mechanics that drive gameplay." Visit the 'Aesthetics of Gameplay' website to explore the rest of the show. 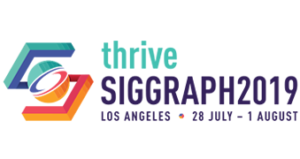 The ACM SIGGRAPH Digital Arts Community (DAC), led by Committe Chair Cynthia Beth Rubin, has a membership of more than 800 digital artists and scientists from all over the world. To join the ACM SIGGRAPH Digital Arts Community, visit the DAC website, a lively platform where members share creative work and network with other artists.